Unless you have been living under a rock, I am sure you have heard about blockchain by this time. While blockchain applications seem disruptive enough, it may not be easy to imagine what a decentralized database can do in practice. Today, we are going to refresh what blockchain technology can do and explore 5 blockchain use cases in the real world. Blockchain is a decentralized database, which records information in a chain format, linking one piece of data to another in a cryptographically secured way. So where are blockchain applications used and for what? Blockchain is a lucrative tool to register and complete transactions. As it can form a large network regardless of physical proximity, it can easily connect the world. Without middlemen, transaction costs are lower, while keeping the network safe and transparent. It is common knowledge that international bank transactions are flawed: usually, a transfer can take up to several days, with heavy transaction fees, several middlemen in between and costs on the exchange rate. Ripple’s aim is to enable cross-border real-time transactions for lower cost. With a growing network of over 200 major institutions, Ripplenet makes international transactions faster, cheaper and safer. Insurance is another promising area with blockchain. Complex insurance contracts can be formulated into smart contracts, equally binding all parties, without differences in interpretation. One of the examples of an automated insurance service is Etherisc, where you can easily buy flight insurance, and get an automatic, nearly instant payout in case your flight is delayed or canceled. All with the help of a smart blockchain application! Do you know where your food comes from? Or your clothes? Supply chain management is a largely complex field, with often tens of middlemen from production to purchase. How can we assure quality, transparency, trust and increase efficiency with products on the long and tedious journey through the supply chain? The answer is blockchain. Ambrosus is the child of 2 novel technologies- blockchain and IoT. Their product is a combination of tracking hardware — IoT chips and tracking gates, where a product is registered automatically on their blockchain network. This allows you to point your phone at your favorite breakfast cereal and discover where the ingredients came from, whether they are free from pesticide and if the temperature of storage was always right. Blockchain is ushering in a new era for advertising. By making microtransactions possible, viewers can be rewarded for their attention to the ads they choose to see. Brave is an internet browser with a built-in ad-blocker and unique reward system with their BAT (Basic Attention Token). 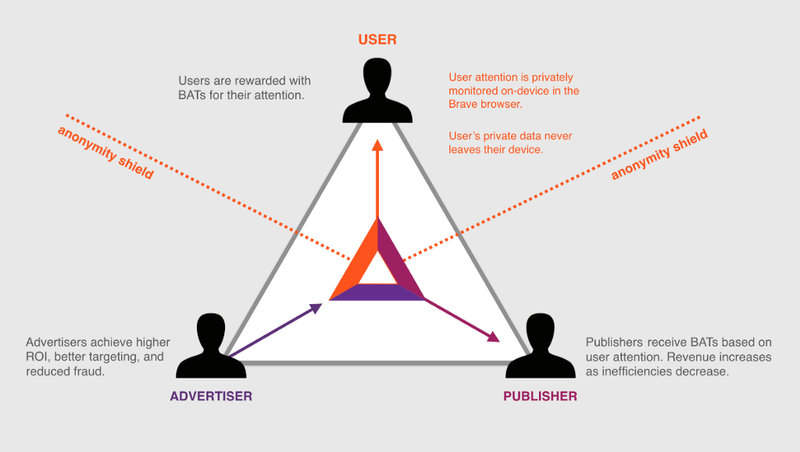 In Brave, users are rewarded if they choose to see ads, while they can in return reward their favorite publishers. This way publishers get 2 revenue streams, and viewers are able to control the amount and quality of ads. With 5.5 million monthly active users Brave is turning into one of the leading blockchain use cases. How do you prove authenticity? Is everyone really paying for copyright when using a song? Artists often find themselves in a hard situation when their hard work is ruthlessly copied. With the help of blockchain, original content — music, photos, paintings — can be protected. On Artory, collectibles are registered on the blockchain, issued their registration card, and each transaction, as the art is sold, is registered on the blockchain. One can easily scan the registration card, and verify the source of the masterpiece. And that concludes our 5 blockchain use cases for today! We are barely scratching the surface of this brilliant invention. There are many more fascinating use cases out there to be discovered. Comment below and let me know what other use cases you would like to see covered in part 2! Originally published at www.datadriveninvestor.com on February 13, 2019. 5 Real World Blockchain Applications That Are Transforming Industries was originally published in Data Driven Investor on Medium, where people are continuing the conversation by highlighting and responding to this story.